There was never a reason, but since my oldest son was born I’ve been lusting after a Valco. Finally, this summer, Valco Baby sent me a sample of the Latitude for review. It was worth the wait. This stroller is a dream come true. First its super-light-weight. The 19 pound stroller is delightful to push with a smooth roll and a dynamic turning radius along a very narrow base that pushing my 12 pound 6 month old (yes, she’s tiny) is seriously like pushing air. Even though its a tiny stroller, the actual seat is large enough for a preschooler (tested by the Kindergartener) but comfortable enough for the baby with a full recline. I have her covered in an attached blanket and she sleeps soundly and comfortably. The 2 handed fold is smooth and simple. And what is fantastic is how small it is when folded. I’m no longer giving up nearly my entire SUV trunk-space to my stroller, now there’s plenty of room for all of my shopping bags, a pack and play, luggage for a trip and whatever else we have packed in at the time. A huge bonus is that, when folded, it still stands vertically, which means a very little footprint when not in use. (Ideal for tight storage spaces, aka my garage). Of course I need to mention the basket which fits my diaper bag with room to spare–more than I need for walking to the bus stop and enough for a quick trip through the mall. I’ve also used the stroller for my Stroller Fit class. This is going to sound funny, but its almost too light. Its a great jogger, so easy to move and zoom around the park. While my classmates pushed their heavy joggers, the Latitude moved so quickly that it sped me ahead of the group. Infant seat attachments are available, though I didn’t use the one that goes with the Britax. The stroller is outfitted and snug enough that, once my baby could hold her head well, I felt fine putting her in the stroller directly. Honestly, I can’t imagine needing another stroller (I know, easy to say right now, right?) But the Latitude meets all of my needs: neighborhood walks, Stroller Fit class, shopping the mall and shopping centers, even amusement parks. Valco’s Latitude EX stroller is really all I can see myself needing. So that dream of a stroller? It really can come true. 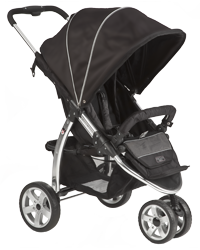 Find Valco Baby’s Latitude EX at Lets Go Strolling, where you can use MWSVALCO for 10% off all Valco Strollers through March 31st, 2010. Thanks to Valco Baby for providing a sample stroller for this review. I own the Valco Latitude (8870) 3 Wheel Single Stroller. While at the park Friday the stroller folded while my 18 month old baby was sitting in it. He went face fist into the sand and busting his lip. I can’t tell you how horrible I felt, I thought it was my fault. I checked the stroller and clicked everything into place. I calmed him down strapped him back in to go home, on our way to the car it happened again! this time catching the skin from his calf in-between the bars. I called and emailed Velco C.S. and have yet to hear back from anyone.